Ever since its debut back in 1999, Nickelodeon’s hit animated SpongeBob SquarePants has always had a flare for the surreal and strange. After all, that’s expected from a show about a sea sponge that lives in an underwater pineapple with a pet snail that meows like a cat, lives next door to a clarinet-playing squid living in an Easter Island head, is friends with a squirrel who uses an astronaut suit to breathe, and works as a fry-cook in a restaurant run by a crab with a literal whale for a daughter. 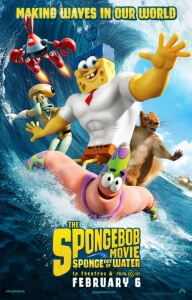 However, The SpongeBob Movie: Sponge Out Of Water – the second film to be based on the show, coming over ten years after the first one – takes that strangeness and surrealism above and beyond the surface (pun intended) in ways that will probably satisfy long-term fans of the cartoon, and potentially haunt everyone else. Does it make it good? Well, it certainly doesn’t make it bad either. In fact, it’s neither of those things; it’s just… weird. Like, REALLY friggin’ weird, even for something like SpongeBob (though having said that, it’s been a while since this reviewer has watched the show so it’s likely, during that time, that things have gotten stranger and stranger in the animation department). This is a film that tries to cram in an air-raid attack of tartar sauce, a Mad Max-style post-apocalyptic wasteland brought on by a lack of “Krabby Patty” burgers, a time-travelling sequence, a live-action pirate sub-plot featuring none other than Antonio Banderas (who, to his credit, looks like he’s having the time of his life hamming it up), not one but TWO miniature musical numbers, a trip inside a character’s brain, a CG superhero epic, a space-dolphin trying to make sure that planets don’t collide with one another which can also shoot lasers from its blowhole, and those are just the ones we can actively remember. It makes Family Guy seem like a coherent narrative, it’s THAT random. We like to imagine that somewhere in the writers’ room there’s a Powerball machine filled with plot points like these, and they wrote a feature-length script based on what came out of it. How else can one explain the things that seem to tie this film together? It is filled up with so much strangeness that all sense of logic, including story and character, have pretty much gone out of the window by this point. What resemblance there is of a plot is held together in the very definition of the word “loose”; the film truly is this bizarre collection of sequences and not much else, a far cry from the first film back in 2003 which did have (slightly) more of a firm plot and character arc for the titular character. This, however, is that common criticism of TV adaptations known as, an extended episode – someone decided to stretch out a ten-minute storyline over 90 minutes, and put the result into cinemas everywhere. As for characters, the familiarity of them with audiences seems to be what drives their watch-ability, because it doesn’t really pay much attention to properly developing them. However, this reviewer must admit that, having watched the original show all those years ago, they still recognised and remembered almost every single major character featured in this movie, whether it be SpongeBob himself, Patrick the starfish, Squidward the, erm, squid, and so on. It may have been based on nostalgia, but that familiarity did help this movie much more than one could have expected. As for the CG portion that has been built up to no end in the film’s advertising, it only arrives in the film’s (closest thing to a) third act. False advertising aside, it’s refreshing to see a mostly 2D animated film make money at the box office again, though it will most likely still be a while before it truly comes back to fruition, despite its current financial success. The animation itself is very colourful and creatively cartoonish, even in its stranger visuals (in said time-travelling montage, nods to 2001: A Space Odyssey are just some of the oddness on display). It may have sounded like we were being far too harsh on The SpongeBob Movie: Sponge Out Of Water, but the truth is that it’s not necessarily a bad movie, nor is it a particularly good movie either. It is what it is, but if you do go and see it, we prescribe unto you a viewing of at least ten episodes of Adventure Time to even things out.